Stories that cannot be checked by any known methods are spread by Sathya Sai Baba to prove he is the most fabulous person every to have lived, and these are wilfully followed up by adherents like Swami Maheswaranand and others. The jungle telegraph at Prashanthi Nilayam went haywire with excitement on two distinct occasions when fabled caves were said to have been revealed through Sathya Sai Baba as existing in the Himalayas, one with an ashram of yogis, and some years later, yet another one supposedly once inhabited by deities. A story published by Swami Maheshwaranand about the discovery of an ancient cave by Sai followers acting on Sathya Sai Baba's secret directions kept Sai followers in a state of credulous anticipation for years. This was the newly-discovered so-called Narayana Gufa Ashram cave, which was claimed to be the place where Vyasa composed the Mahabharata and the Panchama Veda. In other words, sensational news to a high degree among Hindus at the very least. The news was published in a booklet in English translation in Febuary 1990 based on the Hindi text of Swami Maheshwaranand, an ochre-clad clad Indian man who resides at Puttaparthi and whose jaw can invariably be seen chewing away on something, probably reciting mantras etc. He is the only person whose name is published in connection with the entire story, so it all depends entirely on his word. In brief, the book claims that Sathya Sai Baba has sent eleven elderly sannyasis (renunciates) to find a cave at 18,000 ft. in the Himalayas near Badrinath in the heights of Narayana Parvat, accessible only with great difficulty and modern climbing equipment. Allegedly. they survive in temperatures below human endurance and feed daily from a golden bowl materialised by Sathya Sai Baba in which food and drink appears at each mealtime. This is supposed to be the 'Akshaya Patra' fabled in ancient Indian scriptures and such as the discredited Swami Rama claimed he also came to own (Living among the Himalayan Masters by Swami Rama). A fabulous story is woven about this and embroidered with a tale about the Indian Army discovering the cave miraculously and getting involved with the yogis there (none of which is confirmed officially or by anyone involved, all of whom remain unnamed). The three small books by Maheshwaranand, plus his article in a Sai publication (Sathya Sai - The Eternal Charioteer, p. 6), are classic examples of how the most unlikely stories attract those who are already deceived by the Sathya Sai Baba mythology. Maheshwaranand's writing expresses a very primitive form of literal belief in Indian mythology and religious superstition which finds success especially (but not only) with uneducated Indians. There are also plenty of hare-brained Westerners who also subsist mentally in that 'world' of fabulous and incorporeal imaginings. The stories are so fabulous that, if you can believe in them, you should be a strong candidate for taking virtually any fable literally... from Aladdin's lamp, Ali Baba and the Forty Thieves to Baron Munchausen... all is the same class as this 'Gufa ashram legend'. The first thin booklet (Sai Baba and the Nara Narayan Gufa Ashram- Part 1) sold out 10,000 copies in one week. I learned this from the publisher who put up the cash and lost everything himself, Mr. Taylor - an Indian working at Prashanthi Nilayam's 'pop shop' and who had lived long in UK. The Sai Books and Publications Trust manager, Mr. P. Suri, tried to take over the book, probably for his personal profit as in the case of his under-the-counter sales of a book I wrote, printed and donated in 900 copies to the Book Trust. The Gufa ashram book was reprinted and also pirated by other printers. It was therefore followed up by two more volumes to satisfy the huge market demand. One cannot but speculate; Swami Maheshwarand surely needed some means of support, some funds, and so invented a 'magic bowl' (Akshaya Patra) to feed them to him! This hearsay story was never confirmed publicly by anyone supposedly involved in it... and the catch is that the cave in question is in such a secret, security-sensitive area of India on the Chinese border that no one can ever get a permit to visit it! Most convenient! The Patal Bhuvaneshwar cave rumours came later in 1994 in addition to the quite separate Gufa cave story... This new 'sensation' served well to regenerate otherwise flagging interest among news-hungry Sai devotees. It provided a new place of pilgrimage for the gullible believer while helping to build out the mythology of Sathya Sai Baba yet further into the incredible. 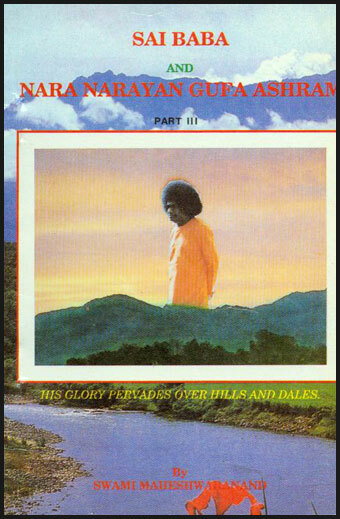 The author of the original publication about this cave, G.K. Karnavar, credits Sathya Sai Baba with the exposure of Patal Bhuvaneshwar as "one of his unique ways to help mankind" and the 'meaning' of which he gives as follows: "i.e Lord Shiv in the underground temple complex" (Whatever that may mean)! He cleverly gave his little book the Sathya Sai Baba-follower enticing title Bhagwan Sri Sathya Sai Baba and Patal Bhuvaneswar. The cave was discovered by Major general Taylor of the Indian Army, reportedly a devout Sai follower. The inside of the cave is largely carved to represent various deities like Ganesha, Sesha and so on. It was claimed that many divine leelas were taking place therein and people who went in there had marvellous visions and transports. It too was related to Vyasa, who allegedly wrote about it in the Skanda Purana as being an abode of deities. Many Sathya Sai Baba devotees went off excitedly to the Himalayas to visit the fabled cave supposedly once inhabited by gods and allegedly discovered through a Sathya Sai Baba dream... where God alone knows what could be vouchsafed to them in visions and boons! One can also find on the internet an account by one of the 'worst cases' in the Bhuvaneswar scenario by another of the many badly-deluded devotees who believe they 'channel' the words and wishes of Sathya Sai Baba, the absurd 'teeth-clacking medium'. Rather entertaining, but also a fair sample of the very populous 'lunatic fringe' that is always prominent in the ashrams and throughout the Sai movement. When I was still the national leader in Norway, I met or was contacted by plenty such. I well recall one who asked me if I could use the powers supposedly conferred by the (fake) diamond ring Sathya Sai Baba gave me to remove (i.e. dematerialise) all his amalgam fillings for him, for he could not afford going to the dentist! It is truly sad to reflect that Sathya Sai Baba and his vague, bogus promises impacts these defenseless and half-crazed people so much and turns many of them into pilgrims seeking healing from him without result other than a great waste of their own funds and the subsequent crash of their hopes and faith. The Patal Bhuvaneswar cave has become a money-earner for Indian tourism. Type the name into Google.com to find further information. It seems very likely that Sathya Sai Baba's name was brought in as being the one to reveal this cave to humanity so as to ensure that more people would hear of the caves, visit them and bring plenty of foreign currency! The glowing accounts that were soon flying about brought Sathya Sai Baba devotees in strength in the hope of promised magnificent visions, transports and instant self-realisation... even liberation from the wheel of life! Oddly, the mythological excitement among Sathya Sai Baba people died down. The idyll was partly spoiled by nasty conflicts about ownership rights concerning the caves, and some vandals desecrated them so it seems that later visitors did not find what they expected. Even a half-decent person claiming to be a teacher and guide would make public denials of untrue rumours for the benefit of those who would be seriously misled and suffer as a consequence of believing such things. Sathya Sai Baba - who claims to be omniscient etc. etc. - most certainly knew by quite ordinary means of the many rumours that constantly flew around about these fabulous events, the one more fantastic and incredible than the other. But presumably, since this is attributed to him and he considers effective in forwarding his name and fame, he lets them run wild and grow in imaginative detail through inaccurate retelling. It seems that he does not realise how few people in the world outside the Hindu community will be able to credit most of the flimsy fables without evidence.